Click on an image to view a larger version. Larger images replace the main image shown above. Stock levels are intended as a general guideline, not a guarantee and do not take into account pending orders. More stock is typically available in Europe. Orders requiring stock from Europe usually ship in 2-12 business days. 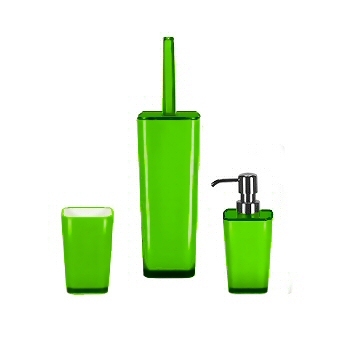 Fashionable bright modern bathroom accessories. These beautiful jewel tones will add a splash of color to any bathroom decor. All the pieces have a modern flared design. Such a nice touch! These accessories are made of durable acrylic. Designed and produced by well-known German brand Kleine Wolke, established in 1968, and is backed by their quality guarantee..
Tumbler: Flared modern design with white acrylic revealed on the inside. Nice contrast! This piece can also be used as a toothbrush holder. Soap Dispenser: Durable shiny chrome pump head attaches to the flared body of the soap dispenser. Soap Dish: This rectangular dish shown has a shiny chrome drain piece in the center. Toilet Brush Set: The toilet brush set continues with the flared modern design. The brush head is hidden inside. Orange: Just stunning. Bright orange. The finish is high gloss and the center of the pieces are opaque and the tops and bottoms are transparent. Very fun design. Poppy Red: Bright red with a high gloss finish. The finish is high gloss and the center of the pieces are opaque and the tops and bottoms are transparent. Very unique design. Snow White: Very bright white with a high gloss finish. The finish is high gloss and the center of the pieces are opaque and the tops and bottoms are transparent. Green: Bright grassy green. The finish is high gloss and the center of the pieces are opaque and the tops and bottoms are transparent. Cobalt Blue: Stunning deep blue. The finish is high gloss and the center of the pieces are opaque and the tops and bottoms are transparent. Black: The finish is high gloss and the center of the pieces are opaque and the tops and bottoms are transparent. Yellow: Shiny yellow. The finish is high gloss and the center of the pieces are opaque and the tops and bottoms are transparent. Turquoise: Bright turquoise. The finish is high gloss and the center of the pieces are opaque and the tops and bottoms are transparent. Cyclamen Pink : Bright hot pink. The finish is high gloss and the center of the pieces are opaque and the tops and bottoms are transparent.